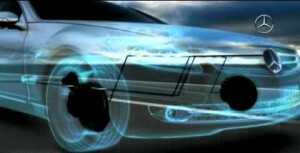 Mercedes Benz is one of a few that are currently spearheading automobile technology safety. Their latest safety brakes, aptly titled the, ‘Pre Safe system’ is another from an impressive list of braking developments the automobile company has made in the past few decades. This system takes measurements from your vehicles speed, steering, breaking and suspension sensors to make calculations, used to help determine the vehicle’s level of safety and the probability of losing control. The system then moves on to issue a warning to the driver and takes the necessary safety engagements like closing on the windows and sunroof. This is done if loss of control is detected and the driving condition continues to persist, despite the issued warnings. According to studies conducted in their R&D lab in Germany, 19% of accidents that occur, happen due to the lack of proper attention on the road. The studies also show most of these accidents often comprise of front to rear collisions. This new automobile technology system sends out radar signals and reads them before estimating the speeds at which the obstacle ahead is approaching. The measurements are taken from a distance of 200 meters, providing adequate time to issue a warning. The safety brakes have been noted to reduce the number of pile up accidents by 35% which is a large amount on its own. 19% of accidents that occur, happen due to the lack of proper attention on the road. “PRE-SAFE® Brake can be switched off by the driver. If it switched off, it remains off until it is turned back on again and does not default to ‘on’ at the beginning of a new journey. Mercedes Benz E- Class vehicles have the PRE-SAFE® Brakes but there is also an option on the EU 27 as a complimentary safety brakes offering. Consulting you local dealer will provide you with further information regarding vehicles with the new automobile technology in you state.